A Night In The Pech Valley by Grant McGarry great read so far. Violence of Action. I didn't really expect a collection of short stories, but I really enjoy reading it so far. And I have a new found respect for the Ranger Regiment, they have evolved so much since 2001. I would recommend it for anyone who wants to learn about what Rangers do these days. Waaaaaayyyyyyyy more than airfield seizure. Two brothers put together a covered wagon and a mule team and do the Oregon Trail the old school way. Book is kind of a mishmash of history, wagon technology, mule handling, dealing with wagon wrecks in the middle of nowhere, and a running commentary on present day America. Really fun read. Those two dudes had one hell of a summer! Leadership in the Shadows by Kyle Lamb. Strongly recommend this book no matter what you do in life. Interesting book on a SFARNG unit in the Pech Valley of Afghanistan in the early days 03-04. Interesting to read about how different it was then compared to when I was there on 2010. 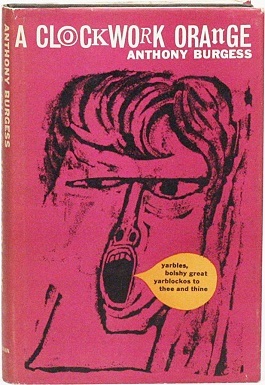 Anthony Burgess' 1962 tour de force "A Clockwork Orange"
Good book I read the Brit version with the extra chapter. Just finished "Bull Mountain", by Brian Panowich. If you like "Justified", the TV series...you might like this book. Just finished "Ashley Bell" by Dean Koontz. This is some of his best writing. Almost a lyrical prose. Character development is off the charts. Just started "The Bone Labyrinth" by James Rollins. Just finished 13 Hours about Benghazi. Pretty good read, I haven't seen the film yet, hopefully it doesn't stray away from the book. Starting Lions of Kandahar now. I've heard great things. I read the Way Of Men last week while cooped up in a plane, good book, well worth reading....Also read the Phoenix Checklist by Joseph Campbell a couple weeks ago, it was ok but could have been a 3 page essay and done a better job getting its point across. Thomas Jefferson and the Barbary Pirates. Nonfiction but reads like a novel. Where are the Jeffersons and Adams... Of today? All's Fair: Love, War and Running for President by Mary Matalin and James Carville. Just saw the two of them speak last week. It was definitely worth my time. Secret Corps by Peter Telep. I'm just about finished reading "The Outpost" by Jake Tapper. Really, really good read and very sad...as war tends to be. There were so many times I wanted to throw that book. How come? Was the info bad, or did you just find the stories that upsetting? Just the stupidity of some of the officers. The whole driving that LMTV up that road etc. I liked the book some of the stories would just crank me up. Apollo the Definitive Sourcebook by Richard W. Orloff and David M. Harland. 650 pages of very comprehensive historical and technical data about the entire Apollo space program, right from the very beginning to it's very last day as an active NASA program. Geez Louise, it is dry as a crouton, with the authors only really interested in giving you every last tidbit of information about the men, women involved in the production machines and associated materiel and execution of the program as well as being a veritable treasure trove of historical and technical data on all launches, timelines and events in general. And for that, I gotta applaud them - dry reading as it may be, I'm 230 pages in, and still reading with interest. The odd picture and diagram helps, too. Space Shuttle Columbia Her Missions and Crews by Ben Evans. This is a readily easier to read and more relaxing book that does a wonderful job providing a complete history on the first Space Shuttle and up to it's fatal and tragic loss with it's crew. Technical data abounds, but it nicely interspersed with personal interviews of Columbia crews and other NASA personnel, little humourous moments mentioned, and plenty of nicely-written historical/background data on this Shuttle and all of those who built/serviced and flew aboard her.